In this interview, we talked with University of Michigan Athletic Director Warde Manuel about how he went from student athlete to AD, collegiate athletics and the student athlete, Michigan Athletics and more. 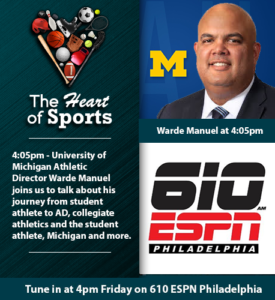 This week we turned the Heart Of Sports with Jason Springer & Jeffrey Cohen Blue as we interviewed University of Michigan Athletic Director Warde Manuel. The we talked the Sixers/Nets series, NFL Draft and Schedule, Phillies, and Tiger's comeback at the Masters. 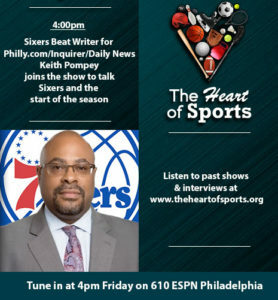 This week on The Heart Of Sports with Jason Springer & Jeffrey Cohen on 610 ESPN we were talking basketball playoffs with Sixers beat writer for the Philadelphia Inquirer/Daily News Keith Pompey joining us at the start to talk about the 1st round of the NBA Playoffs and breakdown of the Sixers/Nets series. Then we had Phillies beat reporter for The Athletic Matt Gelb joining the show to break down the start of the baseball season. It's Final Four weekend in the NCAA Tournament, the Philadelphia 76ers are limping toward the playoffs, the Philadelphia Phillies bats are off to a hot start, the Philadelphia Flyers have one more game before the end of their season, the Philadelphia Eagles are weeks away from the draft and the Philadelphia Union try to stretch their winning streak to 3 tomorrow night. We had that and so much more for us to talk about. 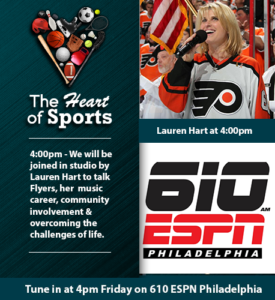 This week we had something special with Lauren Hart in studio to talk about the Flyers, her singing career, community involvement and overcoming life's challenges. Then we talked the Philadelphia Phillies big win to start the season with their new look team, the #Eagles making a move to get their running back with Jordan Howard, the #Sixers with just 7 games left before the playoffs, the NCAA Tourney rolling on and oh so much more. 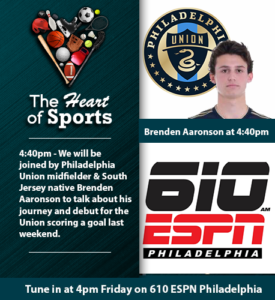 This week on the Heart of Sports we broke down the NCAA Tournament with College basketball Analyst and NCAA Champion Terry Mills, talked Sixers heading to the home stretch, Phillies counting down to Opening day and then were joined by Philadelphia Union midfielder and South Jersey Native Brenden Aaronson for a fun interview. #NFL Free Agency, #MLB Spring training, #NBA & #NHL playoffs on the Horizon & #MarchMadness next week. It's just a great time of year on the sports calendar and we talked all of that along with being joined by Oliver Horovitz, author of an American Caddie at St. Andrews to talk all things golf, preview the Masters & more! 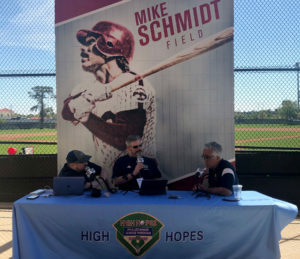 The Heart of Sports was at Mike Schmidt Field at the Carpenter Complex in Clearwater Friday to broadcast from Phillies Spring Training with special interviews including: * Director of player development Josh Bonifay talked to us about his journey to the Phillies. * Pedro Gomez of ESPN talked about the changes to the #Phillies roster, the Bryce Harper saga and signing, and what it is like to be a dad with a son who plays in the minor leagues as his son is currently in the Red Sox System * David Parkinson, last year's Paul Owens award winner for top minor league pitcher in the Phillies farm system. Ricky Bottalico got held up with Bryce Harper signing news and will join us on a future show, but Jason and Jeff had plenty to talk about with the new makeup of the team, potential lineups, pitching staff and current questions. 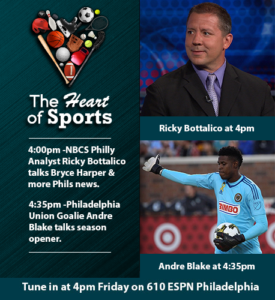 Then the guys talked Sixers, some Eagles and Flyers and were joined by Philadelphia Union Goaltender Andre Blake to talk about the start of the MLS Season this weekend. 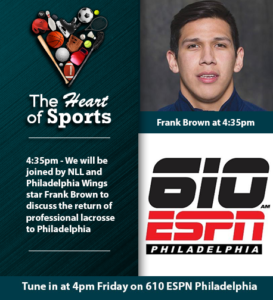 This week we talked to Philadelphia Wings Lacrosse Star Frank Brown about the return of the Wings to Philadelphia and the history of native Americans with Lacrosse. Before that, we talked Phillies 1st Spring training game and the Bryce Harper waiting game, the NBA All Star Game and Sixers, and more. Mike O'Connor, NBA Staff Writer for the Athletic joined us to start this All Star break weekend to talk all things Sixers and the latest news in the NBA as they get ready for the 2nd half of the season. Then the guys talked MLB Spring Training and Phillies, Flyers news and all your football talk. 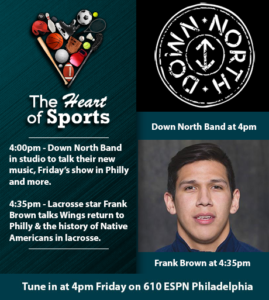 This week on the Heart Of Sports with Jason Springer & Jeffrey Cohen we welcomed back Seattle’s Down North Band in studio to talk about their new music, Friday’s show in Philly, the impact of music in sports and more. And of course we had all the trade breakdown and Philly news from this crazy week. 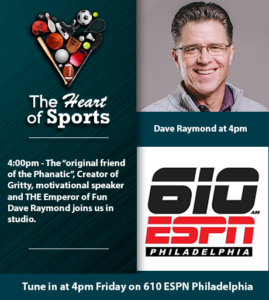 We could have talked to Dave Raymond, the "original friend of the Phanatic" & creator of Gritty, for hours yesterday on The Heart Of Sports with Jason Springer & Jeffrey Cohen on 610 ESPN. In the podcast, you can hear how he went from a college punter, to Phillies intern to first friend of the Phanatic. He tells us the origins of Gritty and the warnings he gave the Flyers before the mascot was unveiled. You can hear that and much much more in this discussion. You'll want to take the time out and catch this show. Jeff Cohen is back and we had plenty to talk about. The Sixers are 3-1 on a tough stretch of schedule but are dealing with injury issues, we are on the road to the Super Bowl after the NFC & NFC Championships, Roy Halladay is headed to the hall of fame, the NHL and NFL All Star games are this weekend, NHL on break and more. 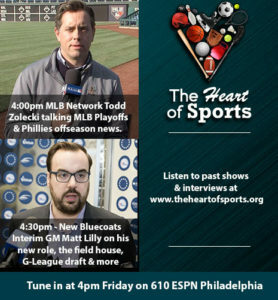 This week on the Heart of Sports we looked back at some of of the interviews we've had in the past few months including: Professional golfer Cody Blick who qualified for the Webdotcom tour shooting a 63 with borrowed clubs after his golf clubs were stolen that morning.International Scouting Director for the Phillies Sal Agostinelli talking about how he and the organization help identify, sign and prepare the future major league players.Author of an American Caddie at St. Andrews Oliver Horovitz told us some of his favorite stories of caddying with celebrities, playing on the longest course in the world in Australia that takes 5 days to complete with holes every 100 miles and teeing off from Mt. Everest. 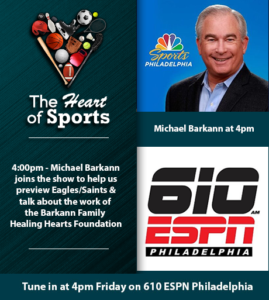 This week on the Heart of Sports we were joined by Michael Barkann of NBC Sports Philadelphia and talked some Flyers Hockey, Eagles/Saints playoff game and the great work of the Barkann Family Foundation helping the community. Then Eagles Insider Dave Spadaro called in to hep us preview Eagles Saints and recap the wild end to the Wildcard win in Chicago against the Bears last week. First show of 2019 on The Heart Of Sports with Jason Springer & Jeffrey Cohen on 610 ESPN and we had Evan Macy, Managing Sports Editor for PhillyVoice, in studio breaking down the #Eagles/#Bears game this weekend and NFL Wild Card weekend. Then we talked MLB Hot Stove as the Phillies signed David Parkinson, #Sixers coming back home after their road trip, #Flyers continued struggles and more. 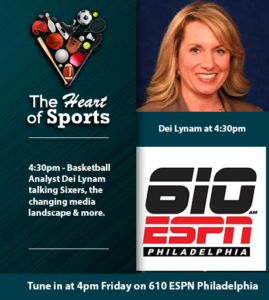 It's the last Heart of Sports for 2018 and we've got Basketball Analyst Dei Lynam in studio with us to talk Sixers, the changing media landscape and more. Jeff and Jason also break down the Eagles playoff changes and preview the College Football Playoff Semi final games. 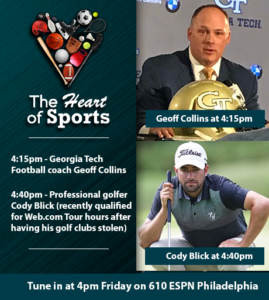 Today on The Heart Of Sports with Jason Springer & Jeffrey Cohen on 610 ESPN, we've got former Temple and new Georgia Tech Head Coach Geoff Collins joining us for a conversation. Then, meet Professional Golfer Cody Blick, who will tell us how he recently qualified for the Web.com tour shooting a 63 with borrowed clubs hours after learning his own clubs were stolen. That and more this afternoon. This week we recap the roller coaster Philadelphia sports week, talk MLB Hot Stove, Eagles, Sixers and Flyers along with having an interview with Jeremy Newberger, Director of the movie Heading Home: The Tale of Team Israel and their journey to the World Baseball Classic. We had two great guests to help break things down on The Heart Of Sports with Jason Springer & Jeffrey Cohen on 610 ESPN. First we were joined by MLB.com's Todd Zolecki to break down the Phillies trade this week discuss more of the rumors about moves for the Phils and around the league. Then we had Fmr #Eagles great and current CFB referee William Thomas join us to break down the Birds/Dallas and talk College Football Bowls and Playoff. Last night on The Heart Of Sports with Jason Springer & Jeffrey Cohen on 610 ESPN, we talked CFB Conference Championships, Flyers changing their GM and where the team stands, #Eagles/#Redskins and Doug Williams embarrassing comments about Domestic Violence accusations being "small potatoes. Then we were joined on the show by #Sixers Philadelphia Inquirer Reporter Keith Pompey to talk about the Markelle Fultz saga, what the team still needs and where they stand right now. 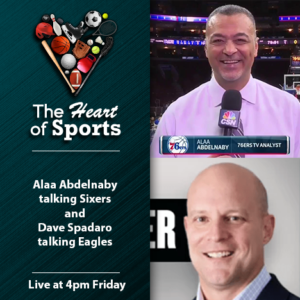 This week on the Heart of Sports we had Sixers Analyst Alaa Abdelnaby call in to talk about the Jimmy Butler deal and the state of the Sixers are the trade. Then the guys were joined in studio by Eagles Insider Dave Spadaro for a candid conversation about the state of the team heading into the game against New Orleans this week. The guys also talked about Jeff's effort sleeping out the night before to raise awareness about youth homelessness with Covenant House. This week on the Heart Of Sports with Jason Springer & Jeffrey Cohen on 610 ESPN when were joined by former NBA player Terry Mills to preview the College basketball season and talk the upcoming Michigan Basketballl v. Villanova Basketballl game. Then we talked #Eagles/#Cowboys, #Sixers, #Flyers and more. This week on the Heart of Sports we were joined in studio for an eye opening conversation with Fmr NFL Player/Current NFL Alumni Board Member Dan Esposito and Covenant House Executive Director John Ducoff about their upcoming National Sleepout for Covenant House to support homeless youth and sports being a platform to raise awareness of the many community issues in need of support. Then Jeff and Jason did a whip around the sports world. This week on the Heart of Sports we recapped the Sixers home opening win with philly.com #Sixers beat writer Keith Pompey. Then we previewed the #Eagles game against the Panthers this weekend, talked Flyers, and had an interview with Blue Coats/Sixers G Shake Milton. 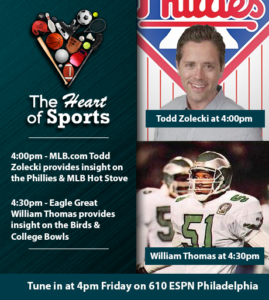 This week on The Heart Of Sports with Jason Springer & Jeffrey Cohen on 610 ESPN we talked with MLB Network's Todd Zolecki about the MLB playoffs and Philadelphia Phillies news. Then we welcomed Matt Lilly, the new Delaware Blue Coats Interim GM about his new role, the new field house, the G-League draft and more. We also talked the Philadelphia Eagles win over the Giants, Flyers, Sixers and more! 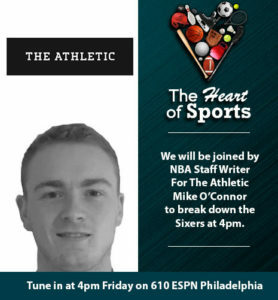 The Sixers are in China moving along toward the start of the season and we had Mike O'Connor of The Athletic joining us to talk about the upcoming season on The Heart Of Sports with Jason Springer & Jeffrey Cohen on 610 ESPN. This week on the Heart of Sports the guys were joined by philly.com Flyers Writer Sam J. Carchidi to break down the team before the start of the season. Then they took a look around the Philly sports world breaking down the Phillies, Eagles and Sixers before talking a little Ryder Cup golf. 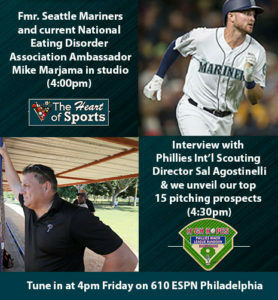 Today on the Heart Of Sports with Jason Springer & Jeffrey Cohen on 610 ESPN we were joined in studio by former Seattle Mariners catcher Mike Marjama to discuss his time in baseball and his efforts to raise awareness about eating disorders as an Ambassador for the National Eating Disorders Association (NEDA). Then on High Hopes: Phillies Minor League we unveiled our end of season list of Philadelphia Phillies top 15 pitching prospects and were joined by Phillies Int'l Scouting Director Sal Agostinelli. 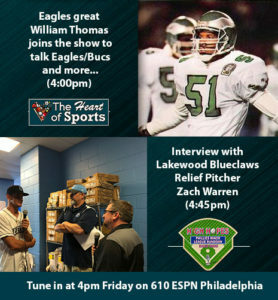 This week on the Heart Of Sports with Jason Springer & Jeffrey Cohen on 610 ESPN we were joined to start the show by Former Philadelphia Eagles great William Thomas to preview the Birds/Bucs game this weekend and more. Then during our High Hopes: Phillies Minor League Rundown we had Jeff's listing of the top 15 hitting prospects in the system and an interview with Lakewood BlueClaws Relief Pitcher Zach Warren. After the Eagles kicked off their season last night with a win over Atlanta and raising a championship banne, we recapped the good and the bad, the weather and the waiting. Following our review of the game, we had an interview with Delaware Blue Coats Director of Marketing and Communications Alex Yoh about the excitement for the upcoming season and new facility. Then on our High Hopes: Phillies Minor League Rundown we talked with Lakewood BlueClaws ace Will Stewart on his incredible season, the rigors and rewards of a full 140 + game season, the playoffs and how much fun he is having. This week on The Heart Of Sports with Jason Springer & Jeffrey Cohen on 610 ESPN, we spoke with MLB on TBS analyst (and former All Star and World Series champion) Ron Darling about this Sunday's nationally televised Phillies/Cubs showdown (airing at 1:30 pm ET). Then on our High Hopes: Phillies Minor League Rundown we will be airing our interview with Phillies prospect and current Lehigh Valley Ironpig Cole Irvin. It is 25 minutes with a really fun, smart, self-confident, well-rounded young man. Not only did he just earn the single season team record for wins (which he could extend this weekend), but is a true student of the game and life. Learn about his new businesses/ventures, that a minor league baseball is actually different than a major league baseball and how he got the nickname 'Swirvin' Irvin." This week on the Heart Of Sports with Jason Springer & Jeffrey Cohen on 610 ESPN we were excited to be joined in studio by Director of Development for The Museum of Sports Ricky Berger to give us an update on the progress of the museum development and talk about their upcoming Eagles kickoff event. 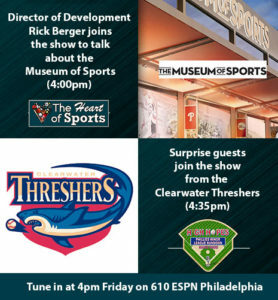 Then on the High Hopes: Phillies Minor League rundown we were joined by Clearwater Threshers Baseball manager Shawn WIlliams, outfielder Mickey Moniak and Pitcher David Parkinson for a chat to talk about their development, community work and march to the playoffs!. Then we ran down the minor league system as it stands this week. 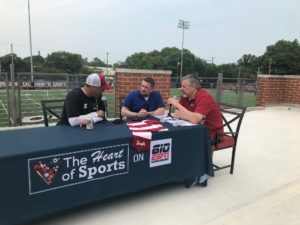 The Heart of Sports went on the road to Temple Football watching practice & doing interviews w head coach Geoff Collins, Offensive Coordinator Dave Patenaude, starting QB Frank Nutile and starting safety Delvon Randall. This show is absolutely worth a listen. This week on the Heart of Sports we talked about the 1st place Philadelphia Phillies, recapped the Eagles 1st preseason game and talked about the importance of Brian Dawkins raising awareness about his mental health challenges at his Hall of Fame Speech. Then on the High Hopes: Phillies Minor League Rundown we were joined by the head of International scouting for the Phillies Sal Agostinelli. This week we had so many interviews with Reading Fightin Phils that we made it an hour show. Interviews this week include Austin Bossart, Adam Haseley, Connor Seabold and Dan Dirt Douglas! 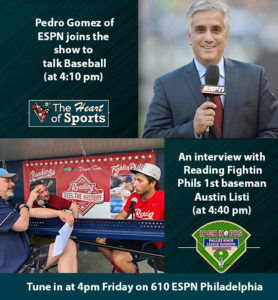 The Heart Of Sports with Jason Springer & Jeffrey Cohen this week features guests including ESPN’s MLB Reporter Pedro Gomez and Austin Listi, one of the Phillies top prospects, who is mashing at AA Reading. This week on the Heart of Sports, Jason and Jeff were joined by Keith Pompey to talk about the Sixers offseason and all of the NBA Free Agency movement. Then the guys talked about Jeff's trip to the MLB All Star Game this Past week. In the High Hopes: Phillies Minor League Rundown they had an interview with Williamsport manager Pat Borders. 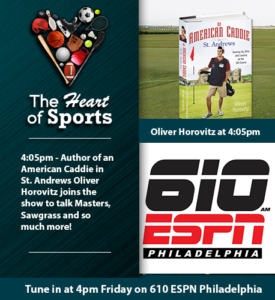 This week on the Heart Of Sports with Jason Springer & Jeffrey Cohen on 610 ESPN we had a great conversation with Oliver Horovitz about his amazing golf journey as chronicled in the book An American Caddie in St Andrews, Pratima (the Nepalese golfing sensation featured on 60 Minutes) and preview The Open. 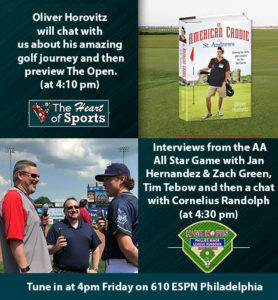 Then on our High Hopes: Phillies Minor League Rundown we had interviews with Reading Fightin Phils Zach Green & Jan Hernandez & Binghamton Rumble Ponies Tim Tebow from the AA All Star Game and Philadelphia Phillies minor league player of the week Cornelius Randolph. 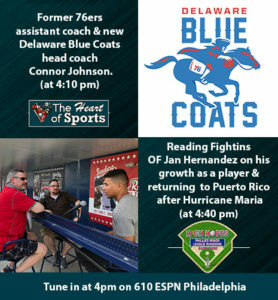 This week on the Heart Of Sports with Jason Springer & Jeffrey Cohen on 610 ESPN, we spoke with former Philadelphia 76ers assistant coach and new Delaware Blue Coats head coach Connor Johnson. Then on High Hopes: Phillies Minor League Rundown, we talked with Philadelphia Phillies prospect and current Reading Fightin Phils OF Jan Hernandez about his growth as a ballplayer and returning to Puerto Rico, and playing in the Puerto Rican Winter League, in the aftermath of Hurricane Maria. This week on the Heart Of Sports with Jason Springer & Jeffrey Cohen on 610 ESPN, we were joined by #Sixers expert Keith Pompey to help us make sense of last night's NBA Draft. Then in our High Hopes: Phillies Minor League Rundown we had an interview with top prospect and Reading Fightin Phils Pitcher Jo Jo Romero talking about baseball life. This week on The Heart Of Sports with Jason Springer & Jeffrey Cohen on 610 ESPN we went around the World of sports talking everything from the FIFA World Cup in both 2018 and 2026, to the NBA Draft next week and US Open Golf Tournament. Then during our High Hopes: Phillies Minor League rundown we talked about our trip to the Lakewood BlueClaws this week to participate in Military Appreciation night and had an interview with Reading Fightin Phils Manager Greg Legg. This week our guest LPGA great Paula Creamer chats with us about this weekend’s ShopRite LPGA Classic, The Solheim Cup, her comeback from injury and paying it forward with her support for youth golf through The First Tee and the military. We will also talked about Bryan Colangelo's resignation and what is next for the Sixers. Then in our High Hopes: Phillies Minor League Rundown we recapped the week in the Philadelphia Phillies organization and had an interview with AA Reading Fightin Phils Outfield Darick Hall. 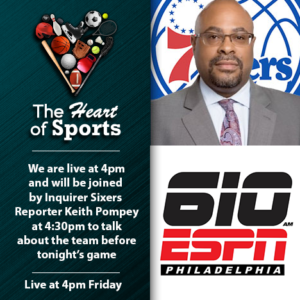 This week on the Heart Of Sports with Jason Springer & Jeffrey Cohen on 610 ESPN the guys were joined to kick things off by Philadelphia Inquirer/Daily News reporter Keith Pompey to talk about the #Sixers/Bryan Colangelo #Twitter controversy as news on that story continues to break by the hour. Then on the High Hopes: Phillies Minor League Rundown portion of the show we featured an interview with Lehigh Valley IronPigs Manager Gary Jones. 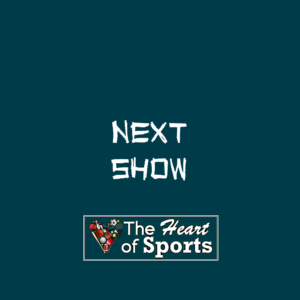 This week on the Heart of Sports we went around the sports world, discuss the NFL’s latest attempt to address social justice issues and talk with Brandon of Down North about their appearance in Philadelphia at Hoagie Nation this weekend and the band’s Seattle roots. Then we had our High Hopes: Phillies Minor League Rundown recapping the week in the Phillies farm system and featuring an interview with Pat McCarthy talking about Lehigh Valley Iron Pigs, his growth as an announcer and the team’s great work in the community. This week on the Heart of Sports, Jason Springer and Jeff Cohen break down the Supreme Court decision legalizing sports gambling and its implications, discuss the Phillies continued good play and then recap the NBA Draft Lottery and what it means for the Sixers. Following that, the High Hopes: Phillies Minor League Rundown featured interviews with Lehigh Valley Iron Pigs players Roman Quinn and Nick Rickels. This week on the Heart of Sports the Sixers playoff run comes to an end and we recap the season. 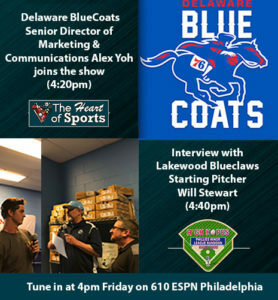 Then we talked some Phillies before our High Hopes: Minor League rundown segment featuring an interview with Lakewood Blueclaws manager Marty Malloy providing great experience and insight into the development of the Phillies youngest prospects! 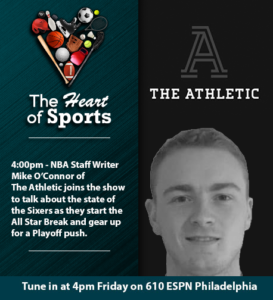 This week on the Heart Of Sports with Jason Springer & Jeffrey Cohen on 610 ESPN we were joined first by Mike O'Connor of The Athletic to talk about the Sixers/Celtics playoff series. Then we had the debut of our new segment on the show, the High Hopes: Phillies Minor League Rundown where we will take a look at all levels of the Phillies Minor League farm system and feature interviews with players and coaches. Great time this week on The Heart of Sports with Jason Springer and Jeff Cohen. To begin the show we were joined by Philadelphia Inquirer Writer Keith Pompey to talk about the Sixers big win in game 3 of their series with the Heat. Then Miami sports host on 790 the Ticket Leroy Hoard called in to give us the take from the Heat side of the ledger following their big game 3 loss. And finally Aaron Beasley called in with the guys to talk about his new organization, the Athletic Business Association and what the transition to life after football is like. 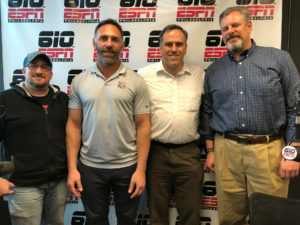 This week on the Heart of Sports with Jason Springer and Jeff Cohen, with Jeff traveling for business Jason was joined in studio co-hosting by Michael Muller and the guys talked with NBA Writer for the Athletic Mike O'Connor to preview the NBA Playoffs and talk Sixers. Then we talked about the Flyers 1st playoff game debacle and what they need to do for game 2, the Phillies start to the season and the pending Supreme Court decision regarding sports gambling. 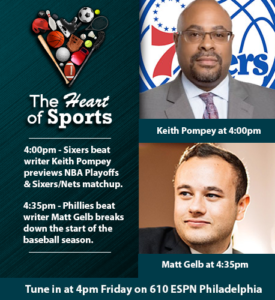 This week on the Heart Of Sports with Jason Springer & Jeffrey Cohen on 610 AM Sports Philly ESPN Radio we started the show talking about the #Phillies, then we were joined by The Philadelphia Inquirer beat reporter Sarah Todd to talk #Sixers and Joel Embiid, followed by a conversation with President of the Delaware Blue Coats Larry Meli to tell us about the exciting new name, facility and community work. We had a special show on the Heart of Sports today with 2 great guests joining us in studio. We started the show with Flyers Public Address Announcer Lou Nolan recounting his 50 years in hockey talking about everything from his start with the Flyers, to the Stanly Cup parade, to the Flyers game against the Russians, to community involvement like Ed Snyder Youth Hockey and the Flyers Wives Carnival. Then Sixers Beat Writer Keith Pompey stopped by the studio for a fun interview to talk about the Sixers push for the playoffs, the development of the young players on the team and the impact of the traveling fan base on road games throughout the season. As brackets were in the process of being busted, Jason and Jeff were joined on the Heart of Sports on 610am Sports by Philadelphia Inquirer Sportswriter Marc Narducci to breakdown the start of the NCAA Tournament. Then the guys talked about the Eagles and NFL Free agency moved, previewed the Phillies as we get closer to opening day and covered the Sixers and Flyers too. Last night on The Heart Of Sports with Jason Springer & Jeffrey Cohen on 610 AM Sports Philly the guys were joined by MLB.com Phillies reporter Todd Zolecki from Spring training to talk about the dawning of the Gabe Kapler era in Clearwater and what the mood is as camp opens. Then the guys talked Sixers, Olympics, College Basketball and more. Jason Springer and Jeff Cohen wrapped up an amazing Eagles Superbowl season this week talking with fans who were at the parade with their friends and family, fans who were at the game itself and were joined again by Fmr. Patriot and Super Bowl Champion in his own right Matt Light to recap an unforgettable week in Philadelphia sports. 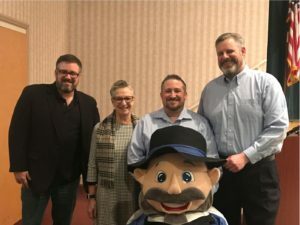 Days before SuperBowl LII, Jeff and Jason were joined first by Philadelphia Mayor Kenney talking about his own fandom for the team, a wager with a Patriot supporting Mayor and the feel of the city. Then they talked with Adam Taliaferro breaking down the game and how the Eagles defense should try to match up against the Patriots offense. Finally the guys were joined by Super Bowl Champion Ravens Kicking Coach Mayor Randy Brown to talk about the game itself, the preparation and the overall special nature of making it to the SuperBowl to finally realize your dreams. From Vodka to Canadien Whiskey to the Super Bowl, this week The Heart Of Sports with Jason Springer & Jeffrey Cohen on 610 AM Sports Philly ESPN Radio spanned the world of sports and more. First Jason and Jeff were joined by Eagles Insider Dave Spadaro to talk the atmosphere at last week's NFC Championship game and the countdown to the Super Bowl. Then, 3 time Super Bowl winner and former Patriot Matt Light joined the show to talk Super Bowl, service to the community, the Light Foundation and vodka... yes vodka. Brian Propp joined the show to talk about what it is like to be on a team chasing a championship in Philadelphia and the Flyers heading into the All Star Break. And then Jeff and Jason talked about the Larry Nassar/MSU/US Gymnastics scandal. Jason and Jeff talk with Eagles Insider Dave Spadaro to preview the NFC Championship and talk the big Eagles win over Atlanta the week before. Then we talked more NFL playoffs and then touched on the Sixers and UCF calling themselves National Champions. Jason Springer & Jeffrey Cohen spoke with Phillies Pitcher and Alabama Alum Adam Morgan about the national championship game win for his Tide. The guys also talked NFL Playoffs and previewed the #Eagles/#Falcons game, Sixers, and looked at the ongoing battle against the Vegas Golden Knights regarding their name. Jason Springer and Jeff Cohen talk College bowl season and the College Football playoff semifinals including Rosebowl classic. Then they previewed the NFL Playoff games for this weekend and talked Sixers. This week on The Heart Of Sports we recapped the #Eagles win against the Giants last week and then did a look back at the year that was in sports including handing out the 1st annual Moldy Cheesesteak Awards. Jason Springer and Jeff Cohen were joined by Fmr. Eagle Garry Cobb on The Heart Of Sports on 610 AM Sports Philly to talk about the state of the Eagles as they head into their Monday Night Christmas matchup with the Raiders. Then Jeffrey Cohen took the opportunity of festivus to air his grievances about the Sixers, Lavar Ball and more. Before the Flyers beat the Stars on Saturday night to win their 6th straight, Jeff Cohen and Jason Springer talked with former Star Marty Turco and former Flyers great Brian Propp to preview the matchup. Jeff Cohen and Jason Springer were joined this week on the Heart of Sports by Phillies Pitcher Adam Morgan to talk about the upcoming season, new coaches, the Army/Navy game and the college Football playoff since Adam is a huge Alabama fan. Then the guys talked about the big Eagles game this weekend, the Sixers week in review, the Flyers on a win streak and the latest NFL News. 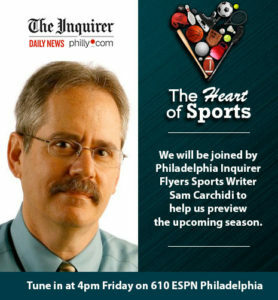 This week on The Heart Of Sports on 610 AM Sports Philly ESPN Radio, Jeff Cohen and Jason Springer talked Flyers with Sam Carchidi (The Inquirer’s Flyers beat writer) about the trouble in Flyersland, and then spoke with Marc Narducci (The Inquirer’s college football writer) to discuss the college football playoffs and coaching carousel. They also talked Eagles and Sixers among other things too. In the episode of The Heart of Sports, we play the full uncut 50+ minute interview with the man who discovered CTE, Dr. Bennet Omalu. Jeff and Jason had a fascinating discussion covering his journey discovering CTE, pushback he got along the way, impact on professional sports and youth sports and then the movie that was made about his story where he was played by Will Smith. Jeff and Jason enjoy Eagles/Dallas week and preview the game this weekend. Then they talk about the Sixers impressive start to the season with a tough road schedule and the potential use of medical marijuana in the NBA. Jeff Cohen and Jason Springer were joined in studio by Philadelphia Eagles Insider Dave Spadaro to talk about the 6-1 Eagles. Then they talked MLB Playoffs, Sixers, Flyers and NFL Owners making things worse. Jeff Cohen and Jason Springer talked with Bob Ford before the Sixers Home opener about the Sixers and Eagles and then spoke with Sam Carchidi about the start of the Flyers season. Jeff and Jason talk: * MLB Playoffs * Flyers season starting, * Eagles with a big win in what should have been a road game against the Chargers, but was more like a home game. * NFL Week 5 * The criticism women in sports media receive. Jason and Jeff are joined in studio by Phillies Director of Fun and Games John Brazer. Then the guys talk about Aaron Hernandez and CTE, followed by breaking down the Eagles and upcoming games for this week. Jason and Jeff talk with PGA golfer Jim Furyk, Unity Cup Director Bill Salvatore and City Commissioner Sheila Hess about the 2nd annual Soccer tournament and then brea down the Eagles and Phillies. Jeff and Jason talk with special guest, Former Phillie and ESPN Analyst Doug Glanville about the Phillies, coaching youth sports and the Colin Kaepernick situation. In addition, they previewed the NFL Games and the Eagles schedule and talked with Brian Propp and Jason Wolf about their Charity Hockey game next weekend. This week on The Heart Of Sports​ Jeff and Jason talked with NFL VP of Policy and Rules Jon Runyan about everything from the upcoming NFL Season, to the Eagles, to fining players for sock violations and rule changes regarding celebrations and even his driving for Uber. After that chat, Jeff and Jason talked about the Eagles pre-season game against the Dolphins, the latest blockbuster NBA trade and the Mayweather/McGregor megafight. Jeff Cohen and Jason Springer talk the 2nd Eagles pre-season game, the reaction of the sports community to the tragic events in Charlottesville this past week, the Sixers schedule being released and the 2nd part of our interview w Dr. Benet Omalu talking youth contact sports and whether you should let your children play. "The Pride of Camden" undefeated boxer Vidal Rivera joined the Heart of Sports in Studio and then hear part 1 of the interview Dr. Bennet Omalu, the doctor who discovered CTE and was the basis for the character played by WIll Smith in the movie Concussion. What a fun show today on The Heart Of Sports. Along with Jeffrey Cohen, we talked Phillies, Pete Rose, Colin Kaepernick, NFL and then had an awesome conversation with Temple Football coach Geoff Collins as he came off the practice field with him team. On this show the Jeff Cohen and Jason Springer previewed the NFL and Eagles season with ESPN NFL Insider Adam Schefter. On this show, the guys recapped the All Star Week festivities, talked home run Derby, graded the Phillies 1st half of the season and previewed the Eagles offense heading into the pre- season. Jeff Cohen and Jason Springer talk with Phillies Assistant General Manager Scott Proefrock about the current state of the organization. Jeff Cohen and Jason Springer talk about the state of the NBA and the Sixers with Bob Ford of the Philadelphia Inquirer. Jeff Cohen and Jason Springer talk Sixers Draft and then talk boxing with Bill Holmes of Boxing Insider.